Awista Ayub is the founder of the Afghan Youth Sports Exchange (AYSE), an organization dedicated to nurturing Afghan girls through soccer and the author of However Tall the Mountain: A Dream, Eight Girls and A Journey Home (Hyperion). In 1981, when Ayub was only two years old, her family fled Afghanistan for the United States, where she flourished thanks to organized athletics - and where she vowed to make a difference in her home country some day. Soon after the fall of the Taliban, Ayub saw her chance: She founded the AYSE, an organization dedicated to nurturing, empowering, and teaching leadership to Afghan girls through soccer and sports. What began with eight young women has exploded into something of a phenomenon. Fifteen teams now compete in an organized league, with hundreds of girls participating through the Afghanistan Football Federation. Ayub has been featured in a number of national news publications and programs including ABC News - "Person of the Week", ESPN, Glamour Magazine, "Making Girls Strong Again" magazine - "Hero of the Month", CNN's American Morning, New York Daily News, Sports Illustrated.com, "A World of Difference: Soccer a Means for Social Change from Sea to Sea", Muslim Girl Magazine, "From Dreams to Destiny", the San Francisco Chronicle, USA Today, and Washingtonian Magazine, "Bend it Like Ayub". A sought after speaker, she has spoken at universities around the country sharing her inspiring message of the power of sports in building confidence and self-worth in young women of all nations. Since Afghanistan's overthrow of the conservative Taliban government, many Afghan women have experienced a rebirth - striving for equality, education, freedom, and protection in a country that is deeply embedded with remnants of a culture of silence. Women like Ayub, 29, have played a significant part of the changing role of females in Afghan society today. By bringing soccer to young Afghan women, Ayub re-introduced the very traits the Taliban had cruelly stripped away from them - confidence and self-worth - on the very fields where the Taliban carried out executions. 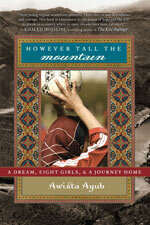 In However Tall the Mountain Ayub details the journey of eight young Afghan women she brought to America to learn to play soccer. Throughout the story, she intertwines accounts of the girls' lives at home in Afghanistan, including their struggles with personal freedom and the consequences of the choices they make that conflict with Afghan culture. Under Taliban rule, these young women all grew up with strict limitations on their freedoms; they were forbidden from playing outside of their homes, not to mention participating in sports teams. The AYSE exchange program taught them not only to play soccer, but also to discover self-confidence and a sense of self-worth. After bringing the girls to the States, Ayub subsequently traveled to Afghanistan to host a clinic there and hundreds of girls turned out to participate - and the numbers of players and teams keep growing. They even play at Ghazi Stadium in Kabul, which once served as the place where the Taliban carried out executions of women who violated even the most inconsequential laws. The country is not without current struggles and women's rights are far from protected. However Tall the Mountain gives hope to women finding courage and strength in one another and in themselves and reveals the ways in which youth culture in Afghanistan is challenging traditional gender roles and transforming the role of women in the Middle East. From February 2005 to January 2007, Ayub served as the Education and Health Officer at the Embassy of Afghanistan in Washington, DC. She was responsible for fostering relationships with organizations, schools, and individuals that work with education and health issues related to Afghanistan. She also founded the North East Women's Collegiate Hockey Association, serving as the league for the greater New England women's ice hockey teams. 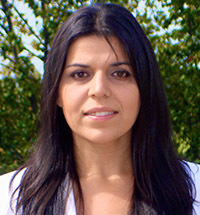 Ayub received her Bachelors of Science in Chemistry from the University of Rochester in New York where she founded the Women's Ice Hockey team and played as the team goalie for three years. In addition, she was a Take Five Scholar in a tuition-free fifth year studying gender issues in science and engineering. She received her Masters in Public Administration with a focus in International Sports Development from the University of Delaware ('09). Ayub recently traveled to Morocco for another program that offers women of the region an opportunity to participate in a similar life-changing experience. "Awista Ayub has movingly captured the indomitable spirit of Afghan women in this chronicle of brave girls who risked persecution and worse to pursue the dreams of ordinary childhood. In doing what they love most in life - playing soccer - the girls become emblems of the fight for equality and human rights under the Taliban. Their story reminds us that there is always hope and possibility for a brighter future - even in the wreckage left by war and conflict." "The young Afghan women in However Tall the Mountain are pioneers. Their story is one of resilience and courage. This book is a testament to the power of hope and the will to dream in a country where so many dreams have been cut short." "This book is a testament to the critical importance across cultures of nurturing girls' potential and dreams." "However Tall the Mountain is a testament to the power of sports and the impact it can have on young girls throughout the world." "Born in innocence, this affecting narrative struggles through a vale of suffering toward wisdom. Readers will thank Awista Ayub for her determination to deepen understanding between the two countries she calls home." "Sport has proven to be an effective tool for development, and Awista's work demonstrates the importance of the role that sports can have towards positively impacting the lives of youth around the world." "Being privileged to grow up in the United States, [Ayub] does not want to leave it at that. She understands how football could empower these young girls and build their self-confidence, way beyond sport. And way beyond this group of brave young girls. Their families. Their communities." "Ayub offers a deeply sympathetic look at these girls and their immensely complicated existences." "A group of Afghan girls are introduced to soccer American-style in this subtly composed, eye-opening tale of cultural clash and transformation." "These are tough girls raised in harsh environments; there is no need to linger on their suffering. Instead we rejoice with them in the freedom and power that comes from athletic achievement. VERDICT: The courage of these eight girls will inspire readers of all backgrounds." "As our world continues to flatten, sports, particularly soccer, has the power to break down cultural barriers that may have existed for generations. The courageous stories in "However Tall the Mountain" teach us all that soccer has no boundaries, and that it can change lives. These young girls prove to us all that while we have our own individual identities off the field, on the field we are universally the same - striving and struggling to achieve our greatest potential."